Set within the mountains of the UNESCO World Heritage Site Dolomites, South Tyrol is Italy’s most northerly region. With around 300 days of sunshine and a snow guarantee from December until April, it really is a great choice for winter sports fans, but there is so much in the region that makes visiting worthwhile. 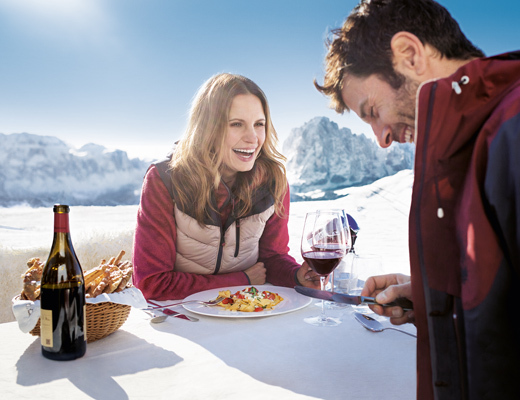 Alpine life and the Mediterranean meet here, mixing the culture, cuisine, wine, landscapes and even the gorgeous weather. Foodies will love the gastronomic offerings to be found in the region. Rural, down-to-earth tastes are spiced up with the charm of the Med creating distinctive flavours, and this influence can also be found in its wines and spa traditions. There are 26 Michelin stars distributed amongst 19 local restaurants. In fact, South Tyrol features the highest density of top-honoured chefs and is the most decorated province in all of Italy. From hearty Tyrolean fare to classic cucina Italiana, there is lots to discover. Visitors won’t want to miss local classics such as spinach dumplings and apple strudel. The Dolomites were awarded World Heritage status in 2009 on account of their unique, natural landscape and special geological and geomorphic significance. Thanks to a natural phenomenon that occurs on the rock, the mountains change to a glorious colour at dawn and dusk known as Alpenglow. The snow and ice creates an effect transforming the ridges and burrs into fairy castles. South Tyrol has around 30 ski areas spread throughout the region, with the majority belonging to the Dolomiti Superski association, the world’s largest ski circuit, or to the Ortler Skiarena, with its family-friendly ski areas to the west. Skiers can hit the piste around the Sellaronda, a 26km route around the beautiful Sella Massif peak, which benefits from well-groomed and accessible pistes, a modern, efficient lift system and plenty of restaurants to stop in for a drink or lunch. South Tyrol offers tailor-made fam trips for the trade throughout the year and a group fam in the winter, and in October this year the region is inviting tour operators to its annual event in London. Three times a year South Tyrol organises business-to-business workshops where it brings together hotels with tour operators, offering a chance to meet with them and to visit the properties.